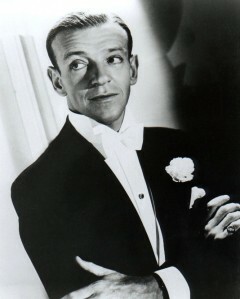 Fred Astaire, born Frederick Austerlitz, was an American film and Broadway stage dancer, choreographer, singer and actor. His stage and subsequent film career spanned a total of 76 years, during which he made 31 musical films. He was named the fifth Greatest Male Star of All Time by the American Film Institute. He is particularly associated with Ginger Rogers, with whom he made ten films. According to another major innovator in filmed dance, Gene Kelly, "The history of dance on film begins with Astaire." Beyond film and television, many classical dancers and choreographers, Rudolf Nureyev, Michael Jackson, Mikhail Baryshnikov, and Jerome Robbins among them, also acknowledged his importance and influence.